Tampon In A Teacup: Higher! Go higher! I'm an adult who loves playground swings. I always have. For a kid who was afraid of just about anything (from needles to zoo animals), I conquered the swings. My awkward long legs let me soar higher than all the other kids. 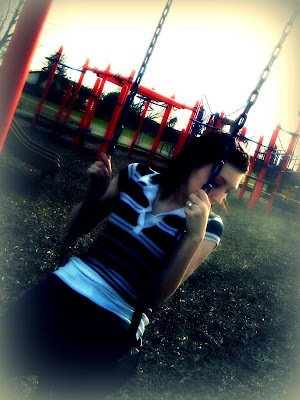 Queen of the Swings, that was me. Higher! Go higher! For the other kids, it was a dare, a challenge. For me, that push to go higher was a necessity. I needed to fly higher, farther from the world below and closer to somewhere new. Somewhere special. A place where I could be myself and love myself without anxiety or pressure or teasing. As an adult, I know that I can't logically go higher; my sight line is already far above the bar (and, hello, gravity). Even knowing this, something about the swings still forces me to push. That need to soar and escape is undeniable. With each playground communion, I feel closer to something great, something wonderful. The swings allow me to have a private and intimate moment with myself. I find myself simply breathing and feeling the air around me, examining how it feels to be in my body. I can shut everything out and enjoy the simplicity of the experience: no noise, no distractions, no racing thoughts...just bliss.